The governorship candidate of the People's Democratic Party (PDP) in Lagos State, Mr Jimi Agbaje, has faulted the appointment of Mr Hakeem Muri-Okunola as the new Head of Service. 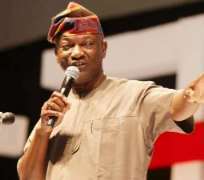 In a statement by his campaign organisation on Thursday in Lagos, Agbaje said the action sacrificed career progression and was politics taken too far. The News Agency of Nigeria reports that Gov. Akinwunmi Ambode had on Monday sworn in 46-year-old Muri-Okunola as the 21st Head of Service (HOS) in the state. Muri-Okunola, who was a Permanent Secretary until his appointment, replaced Mrs Folashade Adesoye, who retired in December 2018. Reacting to the development, the PDP candidate described the appointment as ”insensitive, unjust and disruptive” of the civil service hierarchy. He alleged that the government had forcefully retired no fewer than 21 senior and more experienced permanent secretaries to pave the way for the new man. ”There is a sense of shock and injustice in all these. It is bound to create bad blood and injustice within the system. ”These are seasoned personnel capable of fitting perfectly and effectively in that office. ”But in this era of impunity, they have been offloaded prematurely,” he said. Agbaje said that Muri-Okunola served as the Personal Assistant to former Gov. Bola Tinubu and that the All Progressives Congress (APC) had imbued him with very abnormal privileges. ”Muri-Okunola lacks that broad-based exposure, which makes him a misfit for the post on which he has been imposed. ”Whoever becomes HoS is usually a civil servant with widespread exposure, as he must be abreast of all issues related to the bureaucracy and governance. ”But all these rules and traditions have been bent for this appointment,” he said. Agbaje said the development portends grave danger to the state's bureaucracy, founded on the foundations of merit-nurtured progression through the rungs of the career ladder. ”It is befuddling to imagine how officers who are 15 years older than the new HoS will take orders and directives from him. ”From all indications, this might be too farfetched and difficult, and it has a way of impacting negatively on governance, taking into cognizance that the Civil Service is the engine room of not just government but the society,” he said .